They have a very smooth texture (not gritty at all). It can be applied with your finger, a paint brush, foam brush… all with the same effect. They are great for adding tint and shimmer to paper flowers. I thought they could use a little more shimmer. Unless you used a thick coat, the shimmer was hard to notice (even after stirring and shaking it up well.) *Some colors are better than others. You don’t get a tremendous amount of paint for your money. And as I explained above, the colors weren’t what I normally work with. I used the Pearl color and a stencil to create my own patterned paper with just plain ‘ole kraft cardstock and I used the Ballet Slipper pink to paint my chipboard letters to match my papers. On this card, I used the Ballet Slipper to color the white flowers, adding the Pearl and Crafty to add shadows and highlights, and I used the Morning Mist to add shimmer to the blue flowers. What do YOU think? Do you have these paints? Do you love them? Are these colors right up your alley? Have you used them differently than I have? Are they now, something you have to add to your stash? wow.. u made it so simple to use and very interesting too. This thing never comes to my mind, would really love to try it out. Great page and card! I really love your kraft cS layout. The simplicity of the flowers is divine. 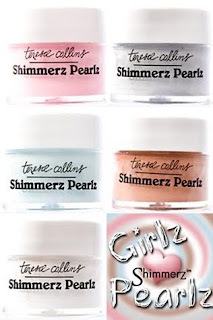 I would love to try the new Shimmerz ,but as you mentioned, I did feel w/ my old Shimmerz that I wanted a bit more shine.... but I'm curious to see the new collection. I love your layout and card! I haven't tried shimmerz. I usually make my own shimmery mist. I haven't had the opportunity to purchase these, thanks for the review. I would love to give them a try! Hmmm, not that "shimmer" is ever easy to photograph, but there doesn't to be anything added from these except cost. Again, though, photographs aren't generally shimmer friendly. As an aside: Your spring blossom photos mixed with the stamped blossom twigs ... GORGEOUS! I haven't seen these yet. Looks like something I'd love to give a try. I too like darker colors but would love to have the white. Your samples looked amazing. Thanks for the review. As you stated above I also don't use alot of paint in my crafting but I would be willing to give it a try. Great projects. I use paint often probably half my layouts lately have included paints. I must say these catch my eye but the price? over $4 for what looks like a tiny jar. I don't see a size listed on any of the sites selling it but unless it's several ounces I don't see myself buying these. Interesting! I would love to try it out! Shimmerz Pearlz are a pearlescent paint. Unlike Shimmerz and Bingz which are super Shimmery and iridesent. Be on the look out for new bright and bold Pearlz colors very, very soon. I think I'd rather read this review and be able to enjoy it when the weird http language isn't in there. I love anything from Teresa Collins Designs and she has had several examples of this product on her blog. I AM interested in trying this product, especially the Ballet Slipper Pink and I really like the results you had with your "just plain ole' kraft cardstock" and also the flowers on your card. Your sample projects are GORGEOUS! I have not tried this product, and frankly just wasn't sure what I would do with it - now I have a much better idea, and would like to give them a whirl! Thanks for sharing with us! love this card. The colors the 3d effect. and the saying. Thinking outside the box. Thanks so much for sharing.